For those who are unaware of what Tritium is, it is a radioactive isotope of Hydrogen and the keychain uses that to excite a phosphor coating to create light in a process called radioluminescence. In short, it doesn’t require any external batteries or charging and will remain lit for as long as the radioactive ‘fuel’ is still decaying. Now, before you panic with Chernobyl and Fukushima in your mind, you have to understand that Tritium decays by emitting beta particles. And if you still remember your Secondary School/High School physics, you’ll remember that beta particles can be stopped by a sheet of aluminum or a thick piece of plastic. In this case, the Tritium vial is encased in a thick piece of plastic, acrylic I believe, so it is pretty safe. But then again, I wouldn’t really put the kit marker in my side pockets, just in case. Anyway, since then I’ve given the kit marker away and was looking to get some more. So where else to look for other than DealExtreme? Turns out, DX stopped selling them awhile back… A quick forum search shows that they’ve been restricted by Paypal. Something to do with shipping radioactive items to the US perhaps? Basically, all traces of the Tritium Kit Markers vanished from the site, except for some reviews. I was quite bummed by that, until I found a UK seller on eBay, Traser Watches, selling the kit markers. The great thing about the seller is that they sell a lot more colours than DX and the pricing is fixed for all the colours. Yay! In addition, they sell the medium and large version of the kit markers. Double-Yay! So I ordered 3 of the kit markers (Red, Green and Blue) last Monday morning, it was shipping that Monday afternoon and arrived on Friday. It seems like the green marker is brighter than the one I got from DX. From a fresher batch perhaps? Now to decide on where to place these kit markers and maybe order the larger ones from Traser Watches. 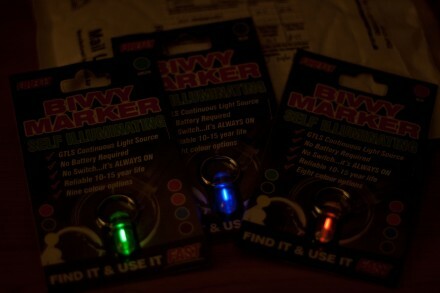 i am keen to try out these tritium markers; like to buy a few first. then maybe order for the guys in my Reservist Unit… email me.